A suicide bomber blew himself up at a wedding reception in northern Afghanistan today, killing at least 22 people including a prominent politician, and wounding 40 others. The death toll makes Saturday’s attack one of the most lethal in the country for months. Influential Afghan lawmaker Ahmad Khan Samangani, who hosted the party, was among those killed, provincial governor Khairullah Anosh said. “It was Ahmad Khan Samangani’s daughter’s wedding. A suicide bomber blew himself up, killing and wounding dozens,” Mr Anosh said. 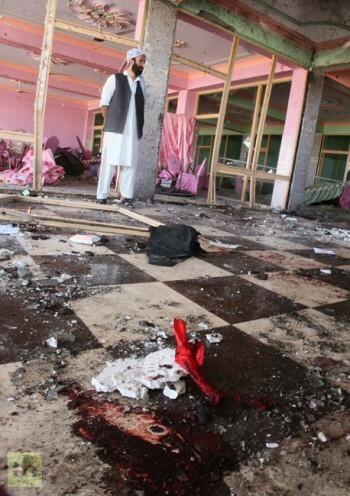 The Taliban denied responsibility for the attack. Mr Samangani, a powerful political figure from Samangan province, was also a former mujahideen chief who fought against the Soviets in the 1980s, and against the Taliban during their 1996-2001 rule. Afghans in some parts of northern Afghanistan, which is relatively peaceful compared with volatile southern and eastern parts of the country, hold ceremonies early in the morning.